Membrane lipids play critical roles in the structure and function of membrane-embedded transporters. Salmonella typhimurium MelB (MelBSt) is a symporter coupling melibiose translocation with a cation (Na+, Li+, or H+). We present an extensive study on the effects of specific phospholipids on the structure of MelBSt and the melibiose transport catalyzed by this protein. Lipidomic analysis and thin-layer chromatography (TLC) experiments reveal that at least one phosphatidylethanolamine (PE) and one phosphatidylglycerol (PG) molecule associate with MelBSt at high affinities. Solid-state nuclear magnetic resonance (ssNMR) spectroscopy experiments confirmed the presence of lipid tails and glycerol backbones that co-purified with MelBSt; headgroups of PG were also observed. Studies with lipid-engineered strains, including PE-deficient, cardiolipin (CL)- and PG-deficient, or CL-deficient strains, show that lack of PE or PG, however not CL, largely inhibits both H+- and Na+-coupled melibiose active transport to different extents. Interestingly, neither the co-substrate binding (melibiose or Na+) nor MelBSt folding and stability are affected by changing lipid compositions. Remarkably, the delipidated MelBSt with only 2–3 bound lipids, regardless of the headgroup species, also exhibits unchanged melting temperature values as shown by circular dichroism spectroscopy. (1) Lipid tails and glycerol backbones of interacting PE and PG may contribute to the stability of the structure of MelBSt. (2) The headgroups of PE and PG, but not of CL, play important roles in melibiose transport; however, lipid headgroups do not modulate the folding and stability of MelBSt. Cell membranes form biological barriers that selectively allow specific ions and solutes to permeate. The functions of cell membranes rely on both lipids and proteins, as well as their interactions. 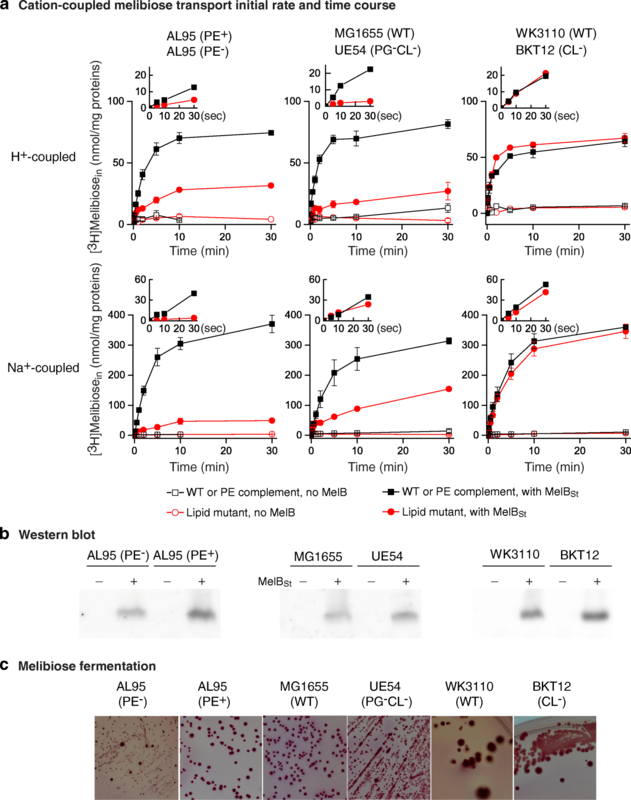 Salmonella typhimurium MelB (MelBSt) encoded by the melAB operon is a cation-coupled symporter with 12 transmembrane α-helices embedded in the cytoplasmic membrane [1–3]. This transporter catalyzes stoichiometric melibiose translocation across the membrane coupled to the transduction of the cations Na+, Li+, or H+ [1, 2, 4–6]. Melibiose active transport against concentration gradient is driven by an electrochemical H+, Na+, or Li+ gradient, while MelB can also catalyze melibiose downhill transport in the absence of these electrochemical ion gradients. MelB is a member of glycoside-pentoside-hexuronide:cation symporter (GPH)  belonging to the major facilitator superfamily (MFS) , a major group of transporters with similar overall fold that is ubiquitously found in all classes of organisms. The high-resolution X-ray 3-D crystal structure of MelBSt at a resolution of 3.35 Å  exhibits a protein fold typical of an MFS permease [9, 10] with two N- and C-terminal 6-helix bundles surrounding an aqueous cavity containing residues important for the binding of galactosides and Na+, Li+, or H+ . Most transmembrane helices are heavily distorted with kinks (Fig. 1), and no lipid was resolved. An alternating-access mechanism was suggested to operate the transport by MelB [1, 2, 11–14], i.e., the permeases cycle different conformational states including at least an outward-open, inward-open, and occluded intermediate state. A recent study suggests that the cooperative binding of the cargo sugar and the coupling cation to MelBSt triggers the global conformational changes . Since the protein is expected to undergo large conformational changes and span several conformational states, how these transport steps are affected by the surrounding lipids is unknown. It has been showed that an optimal melibiose active transport catalyzed by the MelB of Escherichia coli (MelBEc) requires phospholipids containing a C16:1 acyl chain . However, detailed structural and functional studies on the individual effects of lipid headgroups and tails on MelB are not available, and such information is also absent for most membrane transporters. The missing knowledge hinders our understanding of the membrane transport mechanism in general. Bacterial membranes consist of various phospholipids. Structurally, each phospholipid contains two hydrophobic acyl chains (tail) and a hydrophilic headgroup, and the two components are linked by a glycerol backbone. Each headgroup contains a phosphorus and either an ethanolamine (i.e., phosphatidylethanolamine, PE), glycerol (i.e., phosphatidylglycerol (PG), or other groups. In E. coli, the cytoplasmic membrane consist of ∼ 69% PE, ∼ 19% PG, ∼ 6% cardiolipin (CL, a dimer of phosphatidic acids connected by a glycerol), and 5% few other lipid types . This lipid composition is also found with S. typhimurium membranes . The effects of lipid headgroups on membrane protein folding and activities have been extensively studied with the lactose permease of E. coli (LacY) [18–20]. PE was clearly shown to govern the membrane topology of LacY and to be essential for the H+-coupled uphill transport activity of LacY [18, 20, 21]. In the absence of PE, LacY molecules are inserted into the membrane at inverted orientation of transmembrane helices I-VI, and supplementation of PE in vivo [20, 22, 23], in situ , or in vitro , restores the overall protein folding to a nearly native topology, as well as lactose uphill transport activity. Notably, while PE is needed for LacY to carry out uphill accumulation of sugar substrates, it is not required for sugar gradient-driven downhill equilibration [18, 20, 25]. PE effects on membrane topology and function have been also described in other H+-coupled transporters including the phenylalanine permease PheP  and γ-aminobutyric acid permease GabP , and the members of amino acid-polyamine-organocation (APC) transporters. 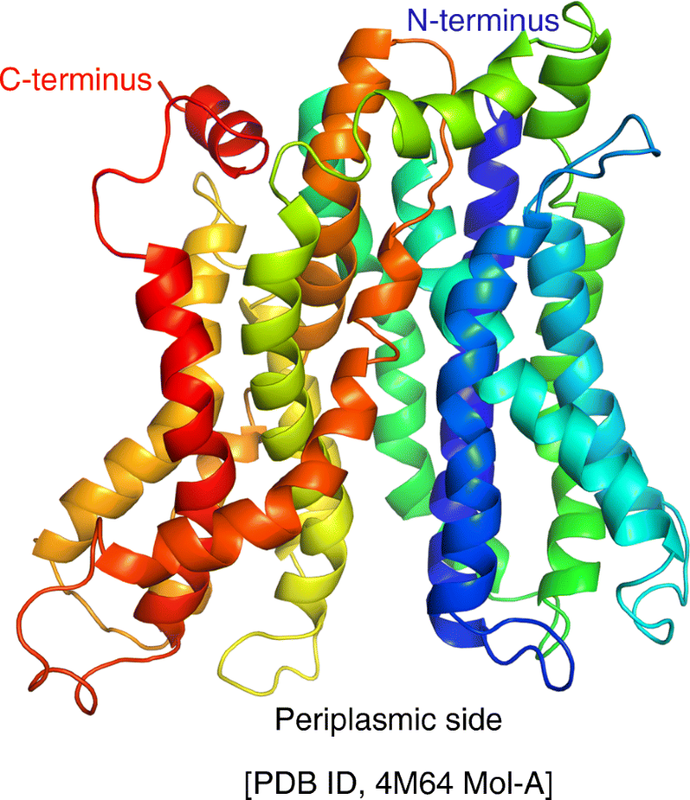 With the bacterial K+ channel KcsA, non-annular lipids were resolved between channel monomers in X-ray crystal structures , and solid-state NMR (ssNMR) spectroscopy studies  demonstrated that these tightly bound lipids feature anionic headgroups. Moreover, functional studies demonstrated that anionic lipids modulate KcsA activity [30, 31]. Recently, a structure of an osmotic stress-regulated betaine transporter BetP revealed five non-annular lipids at the BetP trimer center and three annular lipids at the trimer periphery , likely all PG, providing critical information on the roles of lipids in transport and regulation of BetP. In this study, we applied an integrated approach, including ssNMR spectroscopy, mass spectrometry, circular dichroism (CD) spectroscopy, genetic engineering, and transport assays to analyze the effects of lipid headgroups and tails on MelBSt structure and function individually. We have identified at least one non-exchangeable PE and one non-exchangeable PG that tightly bind to MelBSt. In the absence of PE or PG, the cation-coupled active transport against melibiose concentration is largely inhibited; however, no effect is obtained in the absence of CL. Furthermore, neither the folding and stability of MelBSt nor the binding affinity for its co-substrate melibiose and Na+ is affected by the identity on the lipid headgroups, which suggest that the lipid tails from only few tightly bound phospholipids can stabilize the MelBSt structure. The E. coli AL95 strain (lacY−) is a PE-deficient strain (Tables 1 and 2) . A plasmid pDD72GM carrying the phosphatidylserine synthase-encoding pssA gene (the replication is temperature sensitive) was used for PE complementation (Tables 1 and 2) . This pair of strains AL95 (PE−) and AL95 with pre-transformed pDD72GM plasmid (PE+) was transformed by an IPTG-independent constitutive expression plasmid pK95AH/MelBSt/CHis10 encoding MelBSt with a 10xHis tag at the C terminus. Cells were grown in the presence of glucose to suppress the melAB operon. A [3H]melibiose transport assay with the PE− strain showed that the initial rate and steady-state level of melibiose accumulation for both H+- and Na+-coupled transport modes are largely reduced (Fig. 2a, left column). MelBSt expression in the PE− strain is about 80% of that in the PE+ strain (Fig. 2b), strongly indicating that PE is important for MelBSt transport activity. MelBSt with a C-terminal His10 tag (constitutive expression; ampicillin resistant). pssA+ genR and pSC101 temperature-sensitive replicon (IPTG induction; chloramphenicol resistant). Strain UE54 was derived from the parent WT strain MG1655 with a single gene deletion of pgsA that encodes the phosphatidylglycerol phosphate synthase, lacking both PG and CL . Since PG is the precursor of CL, the lack of CL results from the absence of PG. Notably, the content of PE in this strain is increased up to 90–95%, and there are 5–10% other anionic lipids to support cell viability (Tables 1 and 2). Strain BKT12 lacks CL, which was derived from the WT strain WK3110 by triple gene deletions on clsABC genes that encode three cardiolipin synthases . All four strains have an intact lacY gene encoding LacY and an intact melAB operon encoding α-galactosidase and MelBEc; both LacY and MelBSt also transport melibiose. It is known that the melAB operon is induced by the presence of its specific inducer melibiose, but not by IPTG , and glucose suppresses the activation of both mel and lac operons. To simplify the complexity, we again used the IPTG-independent, constitutive plasmid pK95AH/MelBSt/CHis10, which allows us to test melibiose transport specifically mediated by a plasmid-encoded MelBSt [6, 37]. With Penta⋅His HRP antibody, the western blot shows a similar level of MelBSt expression (Additional file 1: Figure S1, upper panel), and LacY is not expressed under the growth conditions containing glucose (Additional file 1: Figure S1, lower panel). In addition, the [3H]melibiose transport and Trp→D2G FRET assays (Figs. 2a and 3) also suggest that there is no expression of chromosomal MelBEc. Thus, the phenotypes described in these studies reflect the transport catalyzed by the recombinant MelBSt encoded from the plasmid. The transport time courses show that the CL- and PG-deficient strain UE54 exhibits a significantly reduced steady-state level of melibiose accumulation, with approximately 30% (H+-coupled) or 40% (Na+-coupled) of that from its parent WT strain MG1655 (Fig. 2a, middle column). The H+-coupled transport initial rate is even not detectable; however, the Na+-coupled transport initial rate is indistinguishable from the WT (Fig. 2a, inset). Notably, this effect is different from the PE effect (Fig. 2a). Interestingly, when MelBSt is expressed in the CL-deficient strain BKT12, in which PG is present, both of H+- and Na+-coupled melibiose transport is indistinguishable from its parent strain WK3110 (Fig. 2a, right column). Notably, the MelBSt protein expression in these mutant strains is not affected (Fig. 2b). Hence, our data demonstrate that PG plays important role in melibiose active transport activity. All the three pairs of lipid strains carrying the plasmid pK95AH/MelBSt/CHis10 were also grown on MacConkey agar indicator plates containing 30 mM melibiose. Notably, in this medium, melibiose is the sole carbohydrate source for cell growth, and the rate of melibiose transport is the limiting step for melibiose utilization, which can be indicated by the red color development of the colonies due to acidification resulting from sugar utilization [14, 38, 39]. The degrees of acidification may reflect the melibiose down-hill transport activities. The intact melAB operon in all these strains can be induced by the presence of melibiose; thus, the resulting phenotypes should reflect the down-hill transport activity mediated by both endogenous MelBEc and recombinant MelBSt. All these six strains ferment melibiose well, while strain AL95 PE− grew slowly and formed many small colonies (Fig. 2c). The data show that lack of PG or PE exhibits little effect on melibiose downhill transport activities, while both lipid headgroups are important for melibiose uptake against the concentration gradient. To test the effect of lipid headgroups on the initial steps of transport in situ, a well-established Trp→D2G FRET assay was applied to detect the substrate binding, which is based on a fluorescent sugar substrate 2′-(N-dansyl)aminoalkyl-1-thio-β-D-galactopyranoside (D2G, dansyl-galactoside) [6, 40]. The right-side-out membrane (RSO) vesicles in the absence of Na+, which were prepared from the WT and lipid strains expressed MelBSt under the same growth condition as for the transport assay, were mixed with D2G at a concentration similar to its Kd value. Emission spectra were recorded between 430 and 510 nm (Fig. 3a). Emission peaks were detected with a maximum intensity around 495 nm (curve 1) from all samples. This is a signature for MelBSt because MelBEc should have another peak around 465 nm [6, 40]. The intensities are elevated (up-arrow) after adding 20 mM NaCl into the reaction mixture (curve 2) and decreased to a level below the first trace (down-arrow) when continually adding a saturating concentration of melibiose (curve 3). The increase in fluorescent intensity by Na+ is mainly due to the greater D2G binding affinity induced by Na+ , i.e., likely more D2G binding, and could be also partially from Na+-induced conformational changes of MelBSt [6, 40]. The reversal in fluorescent intensity reflects the displacement of bound D2G by the competitive binding of non-fluorescent melibiose. Previous studies have showed that this displacement is specific to the addition of MelBSt sugar substrates [6, 40]. MelBSt proteins in the varied lipid compositions (WT, PE-deficient, CL- & PG-deficient, or CL-deficient membrane) exhibit similar levels of Na+ stimulation and melibiose reversal of the D2G FRET (Fig. 3b), indicating that the MelBSt expressed in different lipid-deficient strains exhibits similar binding affinities for galactosides or Na+. This finding clearly demonstrates that the PE, PG, or CL headgroups are not important for the co-substrate binding with MelBSt; thus, the initial steps of transport are not affected in the absence of PE and PG. An in situ test was carried out by incubating the RSO membrane vesicles carrying MelBSt prepared from the varied lipid strains at 45 °C for 90 min. After detergent solubilization using dodecyl-β-D-maltopyranoside (DDM) and ultracentrifugation to remove aggregations, the supernatants were analyzed by western blot. This in situ study shows that lack of CL alone, PG and CL, or PE, does not affect MelBSt resistance to heat treatment at 45 °C (Additional file 2: Figure S2). The CD spectroscopy was used to examine MelBSt protein folding and thermostability in vitro. 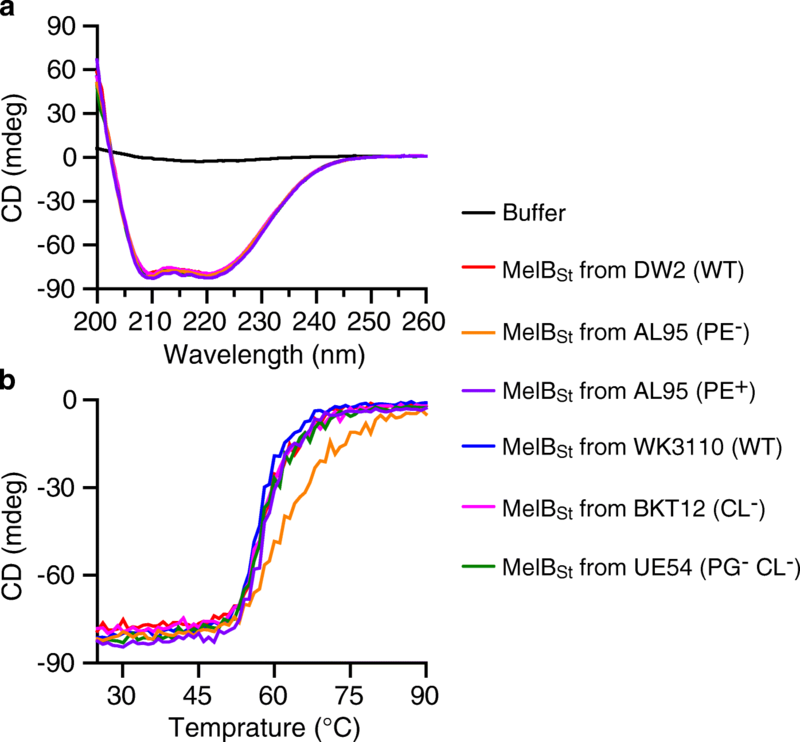 MelBSt proteins were purified from the lipid-deficient strains and their parent strains including another E. coli WT strain DW2, which is routinely used for MelB structural and functional studies [2, 6, 15, 39]. Similar CD spectra are obtained with all of the MelBSt samples (Fig. 4a), showing that MelBSt mainly exhibits α-helical secondary structures as indicated by the two negative ellipticity peaks at 209 nm and 221 nm. The data are consistent with the 3-D crystal structure (Fig. 1) and also strongly indicate that MelBSt is correctly folded in these PE−, PG−CL−, or CL− lipid strains. Thermal-denaturation test for all of the samples were carried out at temperatures between 25 and 90 °C. CD spectra were recorded in intervals of 2 °C, and the ellipticity at 210 nm was separately monitored at each temperature, which was used to determine the Tm values. With MelBSt produced in DW2 strain, the content of the α-helical secondary structures, as detected at 210 nm, starts to rapidly decrease at 50 °C and completely disappeared at 75 °C, yielding a melting temperature (Tm) value of 58 °C (Fig. 4b; Table 3). MelBSt samples produced from varied lipid-deficient strains exhibit comparable Tm values, clearly showing that the major phospholipid headgroups afford little or no effect on MelBSt protein folding and thermostability. 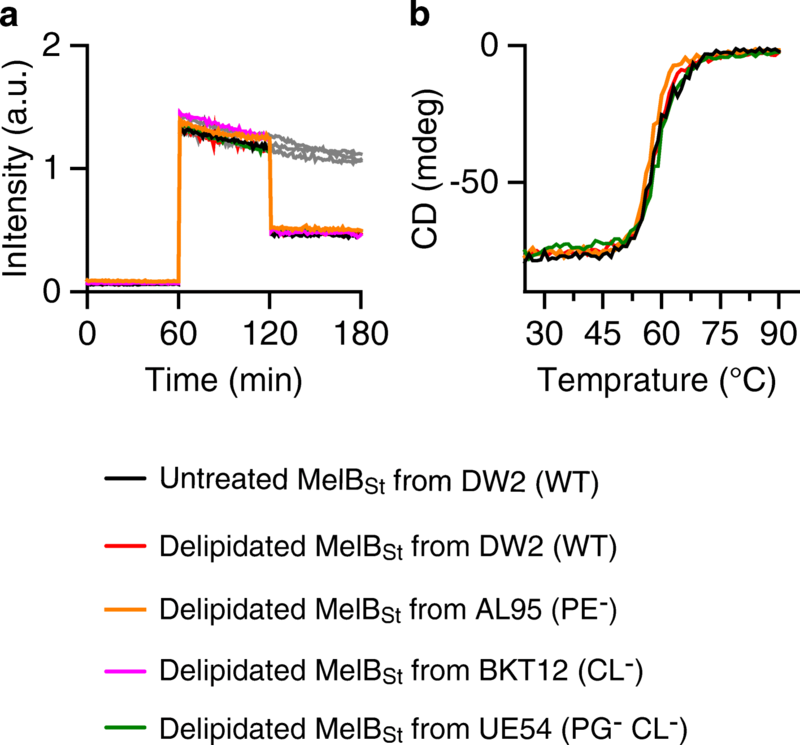 To investigate lipid-MelBSt interactions, uniformly [U-13C15N]-labeled MelBSt was recombinantly produced in E. coli DW2 cells. After purification, the [U-13C,15N]-labeled MelBSt proteins were reconstituted into proteoliposomes using E. coli extract polar lipids at a protein to lipid ratio of 1:1.33 (mg:mg). The Trp→D2G FRET measurements with the proteoliposome samples were recorded by a time trace at an emission wavelength at 490 nm and an excitation wavelength at 290 nm (Additional file 3: Figure S3). Increased intensity was obtained after adding D2G, and reversed by addition of melibiose, but not by water, indicating that the reconstituted [U-13C,15N]-labeled MelBSt maintains the binding capability for both galactosides D2G and melibiose. A dipolar-based two-dimensional (2D) 13C-13C PARIS [41, 42] spin diffusion experiment with a short 13C-13C mixing time of 40 ms was carried out at 950 MHz (1H-frequency) magnetic field using 17 kHz magic angle spinning (MAS) frequency and a real temperature of approximately 265 K. A high-quality spectrum was obtained, featuring many resolved cross-peaks (Fig. 5) as narrow as 0.4–0.5 13C ppm (95–120 Hz at 950 MHz). The resulting signal pattern is in good agreement (Additional file 4: Figure S4a) with the predictions  of chemical shifts calculated from the MelBSt X-ray structure  (PBD ID, 4 M64). Interestingly, strong 13C-13C cross-peaks around 65–75 13C ppm are observed, which is a typical fingerprint of the headgroup and the glycerol backbone of phospholipids . These correlations are clearly not protein signals (Figs. 5 and 6a) and must originate from endogenous 13C-labeled lipids, which were co-purified with MelBSt from the E. coli DW2 inner membrane. The signals from the beginning of the lipid alkyl tails (C1–4) can also be clearly identified. Lipid carbons of the beginning of the tails (around 30–40 13C ppm), involving the carbonyl C1 carbon at 176 13C ppm represent a spin system that also does not exist in proteins (Fig. 6c, in cyan), and the observed chemical shifts agree well with published assignments for lipid tails . These lipid signals exhibit stronger intensities than most protein signals in the 2D 13C-13C PARIS spectrum (Fig. 6c, in cyan). Moreover, using a PARIS-xy experiment  at 950 MHz and 17 kHz MAS that specifically enhances the transfer between spectral regions separated by ~ 30–50 13C ppm and a longer 13C-13C spin diffusion time of 160 ms, we could establish a clear correlation between the glycerol backbone and the lipid tail C2 carbon (Fig. 6d). This unambiguously demonstrates the presence of rigid acyl tails of endogenous lipids in the spectrum. Therefore, the entire lipid molecule must be rigid on the micro- to millisecond timescale, which is the time-scale of the relevant dipolar couplings that drive spin diffusion. Furthermore, these lipid signals remain strong even at elevated temperature of 308 K (Fig. 6b), which also supports that the detected lipids behave differently from bulk lipids. Notably, lipid carbons further down the tail are also likely present in the spectra; however, these carbons exhibit the same chemical shifts and their correlations overlap with the spectral diagonal, so that they cannot be assigned in the spin diffusion spectrum. Moreover, specific contacts between MelBSt and the lipid tail/glycerol-backbone are supported by a 2D ssNMR PARIS-xy spectrum with a very long 13C-13C mixing time of 750 ms (Additional file 4: Figure S4b, blue). The cross-peaks highlighted by a magenta box with signals between ~ 63–57 13C ppm are consistent with specific protein-lipid contacts. To identify the species of the tightly bound lipids, the lipid signature region was further analyzed. Two correlations at 65.8–73.0 and 66.6–73.0 13C ppm can be unambiguously assigned to the glycerol backbone of the co-purified lipids (Fig. 6b, in red) . There are also weaker but well-resolved and symmetric correlations at 69.0–72.1 13C ppm (Fig. 6a, b, in orange), which probably stem from the headgroups of co-purified, 13C-labeled anionic lipids. The 13C signals for the headgroups of anionic lipids have been reported around 69–72 13C ppm [29, 44], while the 13C signals for the zwitterionic PE headgroup would occur at much lower 13C ppm values (55–67 13C ppm) . Further tests with 1,2-dioleoylphosphatidylglycerol (DOPG) liposomes and DOPE:DOPG liposomes (9:1 ratio) show that PG headgroup signal resonates between 69 and 72 13C ppm (Additional file 5: Figure S5), while PE headgroup does not feature 13C signals at this range. Moreover, the headgroup signals overlay well with the endogenous anionic PG that were co-purified with the K+ channel KcsA (Fig. 6e, f) [29, 47]. Hence, MelBSt with tightly bound PG could be established with ssNMR spectroscopy. MelBSt protein samples purified from E. coli DW2 cells, which is the same strain used for U-13C15N labeling, were subjected to lipid analyses by mass spectrometry and TLC. Abundant PE, PG, and trace of CL co-purified with MelBSt were detected. PE is the dominant species counting for approximate 70% of the total lipids, PG counts for approximately 25% PG, and the rest corresponds to other minor species including CL and acyl PG (Fig. 7a; Additional file 6: Figures S6a and Additional file 7: Figure S7). The majority of lipids contain acyl chain lengths of 16–17 carbons (Additional file 8: Figure S8a). Dual phosphorus (Pi) and protein concentration assays were carried out showing that the ratio of lipids to MelBSt is 20.62 ± 1.07:1 mol/mol if we ignore the trace amount of CL that contains two Pi (Table 4). To analyze the tightly bound lipids, three preparations of MelBSt were subjected to detergent washing to remove co-purified lower-affinity lipids. The delipidated samples exhibit a largely decreased lipids to protein ratio of 2.95 ± 0.13:1 (mol/mol), and TLC and mass spectrometry consistently show a decreased PE:PG ratio of approximate 50:50 (Fig. 7a; Additional file 7: Figure S7; Table 4). Notably, change in the lipid chain lengths and lipid unsaturation before and after delipidation treatment were also detected (Additional file 8: Figure S8). The volcano plot of statistics P value versus fold-change clearly reveals that PG is enriched in the delipidated MelBSt at a cost of PE (Fig. 7b). Together, the results strongly indicate that there are at least one tightly bound PE and one tightly bound PG in MelBSt samples. The presence of tightly bound PG is also revealed by ssNMR spectra. Remarkably, the delipidated MelBSt with few tightly bound lipids exhibits the galactoside-binding capability and Tm value comparable to MelBSt in the absence of delipidation treatment (Fig. 8; Table 3). Furthermore, even the MelBSt purified from the PE− strain (AL95) or PG−CL− strain (UE54) shows a similar galactoside-binding affinity and Tm values, strongly indicating that MelBSt stability only requires the presence of a few tightly bound lipid acyl chains and is independent of the lipid head groups. X-ray crystallography reveals that most transmembrane helices of MelBSt are heavily distorted with tilts and kinks (; Fig. 1). This structural information raises interesting questions how the surrounding lipids interact with MelBSt, and how these lipids support and adapt MelB protein conformational changes and structural rearrangements during transport. To address these important questions, in this study, we have utilized an integrated approach and characterized the modulating effects of phospholipids on MelBSt structure and function. Mass spectrometry, phosphorus assay, and thin layer chromatography reveal that the major phospholipids co-purified with MelBSt are zwitterionic PE (70%) and anionic PG (25%) at an estimated lipid to protein ratio of 21:1 (mole/mole) (Table 4). After extensively removing lipids by detergent washing, this ratio decreases to 3:1 (mole/mole) with a PE:PG ratio of approximately 1:1. More PE molecules were removed by detergents; as the result, PG is enriched after delipidation. Our data also demonstrate that at least one non-exchangeable PE and one non-exchangeable PG tightly bind to MelBSt. Solid-state NMR not only enables to probe membrane protein structure and dynamics in native-like membranes but also enables the investigation of lipid-protein interactions [29, 48–53], including the individual interactions of hydrophobic tail, glycerol backbone, and headgroup, as we demonstrate here. MelBSt, as a large (52 kDa) and predominately (> 70%) α-helical transmembrane protein , presents a considerable challenge for ssNMR studies in terms of both sensitivity and resolution. Here, we present high-quality ssNMR spectra (Figs. 5 and 6), which allow us to clearly identify the non-exchangeable PG headgroups and lipid acyl chains in MelBSt, which agrees with the results obtained from mass spectrometry and TLC chromatography. The ssNMR spectra show no signals for PE headgroups, while PE is clearly identified by mass spectrometry and TLC chromatography. Interestingly, the ssNMR signals of the PG headgroup are approximately three-times weaker than the signals of the lipid glycerol backbone and the acyl chains. This raises the possibility that the backbone of the non-exchangeable PE may also contribute to this stronger signal; the PE headgroups may be dynamic so that it is not detectable because the signal intensity in our dipolar-based spectra decreases with molecular mobility increase. It is also possible that increased dynamics of the bound PG headgroup may partially contribute to the relatively weaker headgroup signals. In either case, the interactions of these endogenous lipids with MelBSt are mainly based through their lipid acyl chains and glycerol backbone. Notably, the ssNMR signals on the PG headgroup, glycerol backbone, and the carboxylic part of acyl groups are the full invariant part of all PG species. Moreover, the lipidomic-based analysis of the lipid species and the lipid class, as an independent experimental technique, shows no shift in lipid species pattern for delipidated samples, which agrees with the PG-protein interactions. Interestingly, the type of lipid-protein interactions described here is different for that with the channel protein KcsA, for which only the headgroups, but not the tails, of co-purified lipids are detectable by ssNMR at ambient temperature . To determine the role of the headgroups and the acyl chains for MelB stability, in situ and in vitro thermal-denaturation tests were carried out. MelBSt in varied membrane lipids compositions is resistant to a 45 °C treatment, and MelBSt purified in detergent UDM from WT strain or the mutant strains (PE−, CL−, and PG−CL− strains) exhibits comparable Tm values (Table 3). Intriguingly, the Tm value for the delipidated MelBSt produced from PE− and PG−CL− strains (Table 3) is also unchanged, which strongly supports the notion that the headgroups play little or no role for the MelBSt stability, and even few tightly bound lipid tails can maintain the thermostability of MelBSt. Rigid lipid tails are observed by ssNMR, indicating strong hydrophobic interactions (Fig. 6; Additional file 4: Figure S4b). This type of interaction may have important biological roles in transport processes. This transporter protein must adopt several largely different conformations; thus, it has to be structurally labile, allowing conformational transitions to cycle among several kinetic states. The use of nonspecific interactions through a large area of the lipid acyl chains and glycerol backbone can function as a firm and flexible “grip” that will enable the lipids to follow the protein conformational changes more easily, supporting the protein folding at different conformations. To investigate the effect of headgroups on the MelB binding and transport activity, we performed detailed biochemical analyses. Because of the presence of non-exchangeable lipids, a genetic approach to alter the cell membrane lipid headgroup compositions was applied (Table 2; reviewed in references [54, 55]). Notably, PG is the precursor of CL, so it is challenging to have a strain that contains CL but lacks PG. In addition, the strain that lacks both CL and PG (UE54) is significantly enriched in other anionic lipids (PA and N-acyl-PE) that compensate for the loss of anionic PG and CL and support the cell viability . With these lipid-deficient strains, the expression of MelBSt and binding for melibiose and Na+ are not much affected (Figs. 2 and 3), while the expression level with PE-deficient strain is reduced. The results strongly argue for the conclusions that none of the lipid headgroups is involved in the galactoside binding nor the cation H+ or Na+ binding. These lipid-deficient strains behave differently with regard to the active transport against melibiose concentration gradient. In the PE-deficient strain, both of the initial rate and level of steady-state of the transport are dramatically inhibited, regardless of the H+- or Na+-coupled transport modes. It has been reported that the membrane vesicles prepared from PE-deficient cells can maintain cell electrochemical H+ gradient [18, 57]. Thus, the inhibition on the electrochemical H+ gradient-driven transport activity supports the notion that PE plays important roles to enable MelBSt to catalyze active melibiose uptake while the specific steps have not been identified yet. This PE effect on MelB is quite different from its dramatic effect on the overall structure of LacY [20, 22, 25] or GabP . When both PG and CL are lacking, the active melibiose transport is also largely inhibited, particularly with the H+-coupled transport. Interestingly, no effect on the initial rate is observed when the transport is coupled to Na+ electrochemical gradient; however, when coupled to H+ electrochemical gradient, the transport initial rate is largely inhibited. The CL-deficient strain behaves like the WT, which strongly indicates that CL is not required and the transport inhibition observed in the CL- and PG-deficient strain is solely caused by the lack of PG. 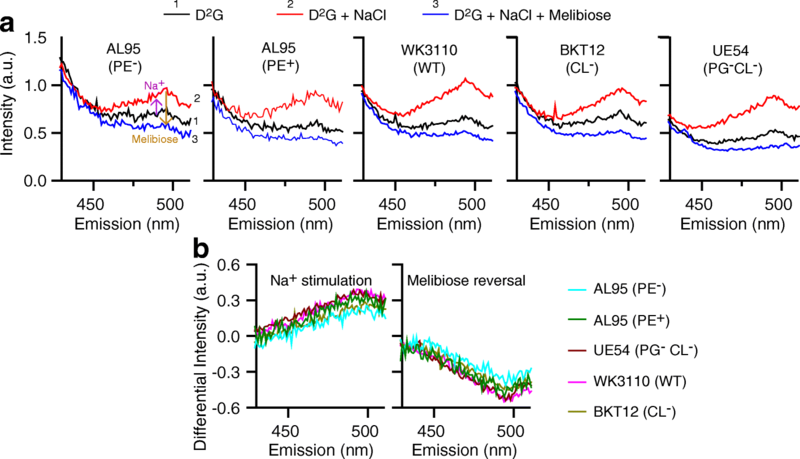 PG headgroup is observed by ssNMR, which is likely the only type of lipid headgroup that strongly interacts with MelBSt and plays important role(s) in the cation-coupled melibiose transport. The negative charged PG headgroups could dynamically interact with the positively charged sidechain(s) presenting in the membrane-aqueous interface of MelBSt and modulate the protein conformational changes. Overall, as clearly shown by mass spectrometry and TLC, PE and PG are both tightly bound to MelBSt, and lack of either species entails functional consequences. In summary, differential roles of lipid headgroups and acyl chains are identified with MelBSt. The lipid headgroups of PE and PG are critically involved in the cation-coupled melibiose uptake. However, specific interactions with lipid headgroups play little or no role in MelBSt folding, substrate binding, nor melibiose downhill transport. With regard to the folding and stability, MelBSt relies on only few tightly bound lipids acyl chains. The 2′-(N-dansyl)aminoalkyl-1-thio-β-D-galactopyranoside (D2G) was obtained from Drs. H. Ronald Kaback and Gérard Leblanc. [1-3H]Melibiose was custom-synthesized (PerkinElmer). Undecyl-β-D-maltopyranoside (UDM), dodecyl-β-D-maltopyranoside (DDM), and octyl-β-D-glucoside (OG) were purchased from Anatrace. MacConkey agar media (lactose free) was purchased from Difco. [U-13C]glucose and [15N]NH4Cl were purchased from Cortectnet. E. coli lipids (Extract Polar) was purchased from Avanti Polar lipids, Inc. All other materials were reagent grade and obtained from commercial sources. All bacterial strains and plasmids used in this study, their sources, and references, are listed in Table 1. LB media were used for cell growth at 30 °C or 37 °C. For the growth of AL95 strain, 50 mM MgCl2 was supplemented . For the strain AL95 carrying the temperature-sensitive plasmid pDD72GM, the cells were grown at 30 °C. Kanamycin at 12.5 mg/L was used for maintaining BKT12 genotype. Ampicillin at 100 mg/L was used for maintaining the plasmids pK95 ΔAH/MelBSt/CHis10, and chloramphenicol at 30 mg/L was used for maintaining the plasmid pDD72GM. DW2 cells containing the plasmid pK95 ΔAH/MelBSt/CHis10 grown in 50-mL M9 minimal media overnight at 37 °C were inoculated into 1-L M9 media containing 0.2% [U-13C]glucose, 0.075% [15N]NH4Cl, and shaken at 37 °C for 16 h. This 1-L overnight culture was inoculated to a 9-L M9 media containing 0.2% [U-13C]glucose, 0.075% [15N]NH4Cl, and grew in 30 °C for 17 h to A600 = 1.6. About 38 g of wet cell pellets were collected. Preparation of membrane samples by passing through Emulsiflex twice to break the cells and ultracentrifugation to collect the membranes were carried out as described previously . MelBSt protein purification using 1.5% UDM to solubilize the membrane samples at a protein concentration of 10 mg/ml was also carried out as described [2, 15, 58]. Purified MelBSt was dialyzed against a buffer containing 20 mM Tris-HCl, pH 7.5, 100 mM NaCl, 10% glycerol, and 0.035% UDM in the absence of melibiose, and yielded 35 mg of highly pure [U-13C,15N]-labeled MelBSt protein sample from 10 L for reconstitution. MelBSt purification from varied strains were carried out using the same protocol as described above [2, 15, 58]. Crude membrane preparations were carried out as described [14, 36]. The reconstitution into proteoliposomes was carried with E. coli Extract Polar (Avanti) at a ratio of 1:1.33 (mg:mg). Briefly, 40 mg of the lipids dissolved in 1.2% OG was mixed with 30 mg of the [U-13C,15N]-labeled MelBSt samples in UDM. After a 30-min incubation at room temperature, the mixture was subjected to a 74-fold dilution by adding buffer containing 20 mM NaPi, pH 7.5, and 150 mM NaCl, and incubated for another 30 min with stirring before ultracentrifugation at 47,000 rpm on a Beckman rotor 70 Ti at 4 °C for 2 h. The pellets were re-suspended in the same buffer and subjected to three cycles of freeze-thaw-sonication. The sonication was carried out in an ice-cold bath sonicator (Branson 2510), 5 s for three times. The samples (5-mL) were washed once with 20 ml of the same buffer and concentrated to a protein concentration of 44 mg/ml by ultracentrifugation under same conditions. About 27 mg MelBSt proteoliposomes was obtained. The Trp→D2G FRET assays [6, 40] were carried out in a 3-mm quartz cuvette (Hitachi F-7000 Fluorescence Spectrophotomer or AMINCO-Bowman Series 2 Spectrometer). When using time traces, the fluorescence intensity changes were recorded at an emission wavelength of 490 nm and an excitation wavelength of 290 nm before and after adding D2G and followed by melibiose. The purified MelBSt or the MelBSt-proteoliposomes sample in 20 mM NaPi, pH 7.5, and 150 mM NaCl at 0.5 μM of protein concentration were as mixed with 10 μM D2G. After recording for 1 min, melibiose at a saturating concentration or equal volume of water were added. For the measurements with RSO vesicles at 1 mg/ml of protein concentration in 100 mM KPi (pH 7.5) buffer, the emission spectra were recorded between 430 and 510 nm at an excitation wavelength of 290 nm at each of the followed conditions: (1) the samples were mixed with 10 μM D2G, and (2) consecutively added with 20 mM NaCl (testing Na+ stimulation) and (3) finally added with the melibiose at a saturating concentration (testing melibiose reversal). 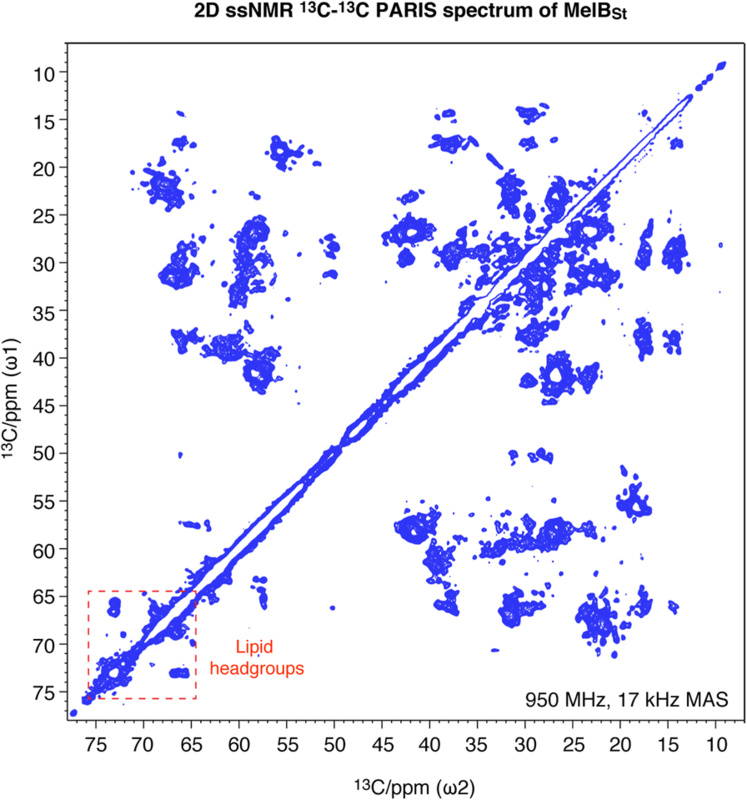 Dipolar-based 2D PARIS [41, 42] (N = 0.5) and PARIS-xy  (N = 0.5, m = 1) 13C-13C experiments on membrane-embedded MelBSt were performed at 17 kHz magic angle spinning (MAS) frequency and 950 MHz (1H-frequency) static magnetic field (Bruker Biospin) at temperatures of approximately 265 K and 308 K. A recoupling amplitude of 10 kHz was applied for a total mixing time of 40 ms and 160 ms in the PARIS experiments and the PARIS-xy experiment, respectively. For each experiment, the phase of recoupling pulses was inverted after half a rotor period (N = 0.5). The 2D 13C-13C PARIS spectrum with membrane-embedded KcsA was performed at 700 MHz (1H-frequency) using 13 kHz MAS and a spin diffusion time of 150 ms.
Melibiose transport activities in E. coli strains were accessed by [3H]melibiose flux assay as described previously [6, 39]. Cells in 100 mM KPi, pH 7.5, and 10 mM MgSO4 were adjusted to A420 = 10, and 50 μL aliquots were used to mix with [3H]melibiose at 0.4 mM (specific activity, 10 mCi/mmol) in the absence (H+-coupled transport) or presence of 20 mM NaCl (N+a-coupled transport). The intracellular amount of [3H]melibiose at a given time-point was collected by a fast filtration and measured by a scintillation counter (Beckman LS6500). Cells were transformed with pK95 ΔAH/MelBSt/CHis10 and plated on the MacConkey agar supplemented with 30 mM melibiose [38, 59]. MacConkey media contains 85.6 mM NaCl, with supplement of 50 mM MgCl2 for the strains AL95 (PE−) and AL95 with pDD72GM. All plates were incubated at 37 °C except the strain AL95 with pDD72GM was plated in a 30 °C incubator. Pictures were taken after 1–2 days, except for the picture of AL95 (PE−) cells that was taken after 5 days. The E. coli strains carrying the plasmid pK95 ΔAH/MelBSt/CHis10MelBSt were grown in LB media supplement with 0.5% glycerol at 30 °C as described previously . With the AL95 strains, 50 mM MgCl2 was added into the LB media. The RSO membrane vesicles were prepared by osmotic lysis as described previously [6, 60, 61], re-suspended with 100 mM KPi (pH 7.5) and 10 mM MgSO4 at a protein concentration of ~ 20 mg/ml, and then stored at − 80 °C. RSO membrane vesicles containing MelBSt at a protein concentration of 10 mg/mL in the presence of 20 mM NaPi, pH 7.5, 200 mM NaCl, 10% glycerol, 20 mM melibiose were incubated at 45 °C for 90 min, then put on ice and extracted with 1.5% DDM. The DDM-extracted solutions were subjected to ultracentrifugation at 355,590g in a Beckman Optima™ MAX Ultracentrifuge using a TLA-100 rotor for 30 min at 4 °C. To analyze the amount of MelBSt in the supernatant fractions, the RSO vesicles at 20 μg and equal volume of treated samples were analyzed by SDS-15% PAGE, and MelBSt signal was detected by western blotting with a Penta-His-HRP antibody (Qiagen). Detergent washing was used to remove lipids loosely bound to membrane proteins . The MelBSt protein at a concentration of 5 mg/ml in 20 mM Tris-HCl, 100 mM NaCl, 10% glycerol, and 0.035% UDM was incubated with 2% DDM for 16 h at 4 °C and loaded onto a column containing Talon resins. After being washed with buffer containing 2% DDM, MelBSt was eluted in a buffer containing 0.01% DDM and 0.2 M imidazole, dialyzed against 20 mM Tris-HCl, 100 mM NaCl, 10% glycerol, and 0.01% DDM, and concentrated to about 15 mg/ml. The content of inorganic Pi was used to estimate the lipid content . Paired MelBSt protein samples at 20 μg (before) and 50 μg (after delipidation) were subjected to phosphorus extraction and estimation using malachite green as described . Briefly, phosphorus was extracted by adding 0.2 mL concentrated perchloric acid and heated at about 180 °C for 30 min, diluted with 0.8-mL water, and mixed with 1 mL of freshly prepared mixture containing 0.3% malachite green, 1.05% ammonium molybdate, and 0.045% Tween 20. Phosphorus standards in the concentration range of 0–0.6 μg were used. After being incubated at a room temperature for 1 h, the color development at 620 nm was measured by a UV spectrometer. The CD measurements were carried out using Jasco J-815 spectrometer equipped with a peltier MPTC-490S temperature-controlled cell holder unit. A 200-μL sample of MelBSt at a concentration of 10 μM in a buffer containing 20 mM NaPi, 100 mM NaCl, 10% glycerol and 0.035% UDM (or 0.01% DDM) were placed in 1 mm quartz cuvette on the temperature-controlled cell holder. CD spectra were collected by using Jasco Spectra measurement version 2 software for a wavelength range of 200–260 nm with a data pitch of 0.1 nm using a band width of 1 nm and scanning speed of 100 nm/min. Each spectrum was corrected by subtraction with corresponding buffer background. The thermal denaturation was monitored at 210 nm, and the temperature ramps 1 °C per minute. The melting temperature (Tm) values were determined by fitting the data to the Jasco Thermal denaturation multi analysis module. TLC. Lipids from MelBSt protein samples at 100 μg (before) or 400 μg (after delipidation) were extracted with 150 μl of CHCl3:MeOH (2:1, v/v), and further mixed with 150 μL of water and 150 μL chloroform. The lipid extracts in chloroform phase were collected after centrifugation at 3000g for 5, further dried by a SpeedVac Concentrator, and analyzed by TLC on a pre-coated Silica 60 plate (Merck, Darmstadt, Germany) using an alkaline solvent system [CHCl3:MeOH: 28% NH4OH:H2O (45:35:1.6:8, v/v/v/v)] . The primuline solution at a concentration of 0.0005% was used for visualization. Lipids were extracted from MelBSt protein samples before and after delipidation treatment using the method of Bligh and Dyer . Chromatography of 10 μL of the supernatant was performed on a hydrophilic interaction liquid chromatography (HILIC) column (2.6 μm HILIC 100 Å, 50 × 4.6 mm, Phenomenex, Torrance, CA), by elution with a gradient from ACN/Acetone (9:1, v/v) to ACN/H2O (7:3, v/v, containing 10 mM ammonium formate), both with 0.1% formic acid, at a flow rate of 1 mL/min. The column outlet of the LC was connected to a heated electrospray ionization (hESI) source of a Fusion mass spectrometer (ThermoFisher Scientific, Waltham, MA). Full spectra were collected from m/z 400 to 1600 at a resolution of 120.000. Parallel data dependent MS2 was done in the linear ion trap at 30% HCD collision energy. Data were converted to mzML format and analyzed using XCMS version 1.52.0  running under R version 3.4.3 (R Development Core Team: A language and environment for statistical computing, 2016. URL http://www.R-project.org). Protein concentration was assayed by a Micro BCA kit (Thermo Scientific). Plasmid-borne MelBSt expression was analyzed on SDS-15%PAGE, and MelBSt signal was detected by western blot with a Penta-His-horseradish peroxidase (HRP) antibody (Qiagen, Cat No./ID: 34460). Expression of chromosomally encoded LacY was evaluated with a site-directed polyclonal antibody against the C terminus of LacY [67, 68] (provided by H. Ronald Kaback) and HPR-conjugated protein A. The chemiluminescent signals were imaged by the ImageQuant LAS 4000 Biomolecular Imager (GE Healthcare Life Science). Parameswaran Hariharan and Elena Tikhonova contributed equally to this work. The authors thank Drs. Gérard Leblanc and H. Ronald Kaback for the E. coli strain DW2, 2′-(N-dansyl)aminoalkyl-1-thio-β-D-galactopyranoside, and MelB expressing plasmid pK95 ΔAH/MelB, and thank Dr. Valentin Rybenkov for the E. coli strain MG1655. Experiments at the 950 MHz instrument were supported by a National Roadmap Large-scale Facility of the Netherlands (uNMR-NL) that receives funding from the Netherlands Organization for Scientific Research (NWO grant 184.032.207). This work was partially supported by the National Science Foundation (grant MCB-1158085 to L.G.) and by the National Institutes of Health (grants R21NS105863 and R01GM122759 to L.G. ), by the Netherlands Organization for Scientific Research (NWO grant 723.014.003 to M.W.) and by the National Institutes of Health (grant R01GM121493 to W.D.). LG and MW conceived and directed this research. PH and ET performed the 13C15N protein labeling and reconstitutions, CD, TLC, as well as all other biochemical analyses. JMS and MW performed the ssNMR measurements and data analyses. AJ and JFB performed the lipidomic LCMS analyses. MVB and WD guided the use of the genetically modified strains and provided discussions. All authors contributed to the manuscript preparation. LG and MW wrote the manuscript. All authors read and approved the final manuscript.